The legendary electronica label Ninja Tune has done what many have contemplated, but no one has crushed: It launched an app, Ninja Jamm, that lets anyone remix music with (relative) ease, using a variety of high-quality releases from world-renowned DJs, producers, and other artists. If this doesn’t start you remixing music, nothing will. By simply downloading this free app, you get access to the remix tools and an initial track to play around with. You can share your masterpieces, of course, via SoundCloud (publicly or privately), and from there to Facebook,Tumblr, Twitter, or wherever else you want to put it. Before you freak out about “remix tools,” and decide that, like other music production software, this is probably a bit out of your depth as a music fan, understand that this is remixing “appified.” All of the music and effects have been broken down into neat little app-y elements, which you can reconfigure at will, using only the skills of an average human being who is mostly paying attention. Plus, there’s a super-easy, clear, interactive tutorial to get you started, which you can access later if it doesn’t take. If you have a musical and/or technical bent, your remixes will turn out better, but the point here, really, is to democratize remixing — and if apps are good at anything, it’s democratizing stuff that used to be hard. Why has nobody done this before? In order to make it work, you need the sound recording rights, publishing rights (or at least those permissions), some app developers (in this case from Seeper), and a bunch of musicians to get onboard. Ninja Tune, as a longstanding DJ/electronica label with a stable of popular artists, is uniquely positioned to pull this off. So, did it? 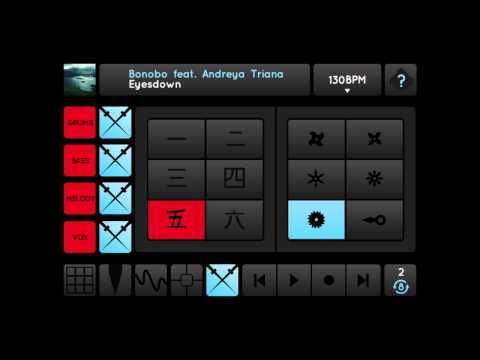 In our hands-on testing with the Coldcut song that comes included (other songpacks cost $1-$3), we found that this app somehow puts a wide range of powerful DJ effects and remix tools at one’s disposal, without the whole thing becoming too overwhelming, and makes it all sound good. You can’t really do it wrong, although practice would surely pay off — especially if you plan on uploading these or performing them live. In the latter case, we’d recommend getting your hands on the fastest (i.e. newest) iOS device you can, because when we activated a ton of effects at the same time on an iPhone 4, we did encounter the occasional dropout. Scratching happens in the Stab tool. You can turn any of the four channels on or off, and set to clip or drill mode (see waveforms). The app is super-responsive, in that when you turn on a track or effect, you hear it almost immediately, without perceptible latency. Drill Mode stutters the sample to create the same effect that makes “Rockefeller Skank” sound like “rock rock rock rock rockafeller rockafeller,” if you remember the Fatboy Slim song. You can loop any part of any track by holding down the start and end points, or “scratch” a certain element using a fairly inventive interface that looks nothing like vinyl. An effects matrix lets you add crush, filter, delay, or reverb to each channel, while an XY (Kaoss-style) Pad applies multiple effects to the same channel on an X-Y axis. A Tempo control does just what you think it would, allowing you to mix into other songs, if you’re using this in a real DJ capacity. You didn’t think they’d leave the tilt sensor and accelerometer alone, did you? Gyroscope Mode lets you tilt the phone to add even more sonic craziness to the XY Pad, while Shake mode adds a glitch effect. Finally, the “Coldcutter” feature adds all sorts of automatic ninja maneuvering, so you sound like Coldcut even though you are not. Does this sound confusing? We promise, it’s not… or at least not too confusing. You will be able to do this. AN ALTERNATIVE REVIEW FOR NINJA JAMM !! !